The Sikh religion started in the 15th century in the Punjab region of the Indian subcontinent. It is based upon the teachings of Guru Nanak. It continued to progress through ten successive Sikh gurus. In Sikhism, the central belief is the concept of the oneness of God. Sikhs consider spiritual life and secular life to be intertwined in observance of their three golden rules: remembrance and devotion to God, earning an honest living and charity and service to others. Sikhs also believe that service and equality go hand in hand. Men and women are created equal. No one should consider any job to be beneath them. 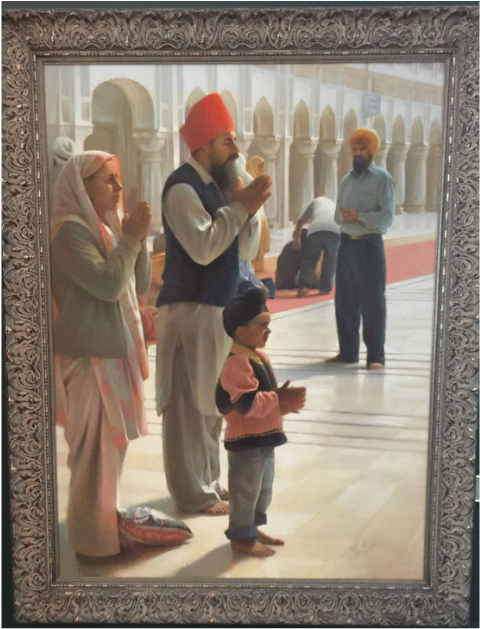 This painting reflects a family praying at the Golden Temple. Please note that the child is imitating been his parents who are in full meditative states.